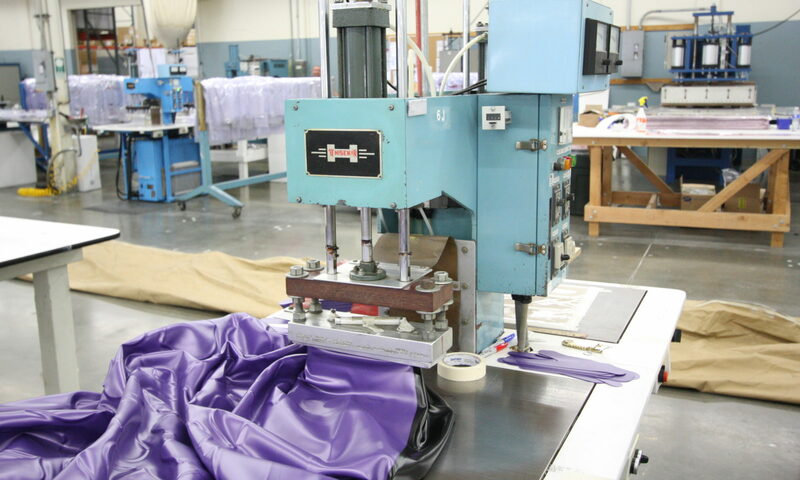 All of APPF Incorporated's RF heat sealing services will provide an airtight, waterproof seam for your product. Under extremely high temperatures, RF heat sealing fuses flexible pliable materials that ordinarily could not be welded together. The process used for your product will largely depend on your manufacturing needs. The size and shape of your products, the kinds of materials, appearance, and the strength of the seam must all be taken into consideration when choosing the best RF heat sealing process. What's the Difference Between RF Sealing and Dielectric Sealing? RF sealing uses electromagnetic energy at a high frequency to bond opposite material types. RF welding and dielectric sealing are individual processes that produce the same welding results. RF heat sealing is utilized for small and medium-sized products that necessitate the sealing of identical or different materials. What are the Advantages of Heat Sealing? One benefit of heat sealing is that it provides your manufacturer with optimal control over smaller and thinner materials. This process is very fast and gets the materials hot quickly. This process is safer, and it keeps its shape perfectly upon sealing. A, RF seam provides the best possible appearance in the seal and the strongest bond performance overall. For larger products, hot air welding can be utilized. Hot air sealing involves the use of a nozzle, which channels hot air between two layers of material. Heat seals are utilized when materials must be configured into sealed chamber constructions, multi-plane configurations, or when very thick materials are being welded. If the material for your project isn't RF sealable, we can utilize hot wedge welding. Hot air welding and hot wedge welding will meld a broader array of materials than RF sealing. For close tolerances and properly positioned voids in the weld, hot wedge sealing offers an optimal fabrication system. Also, when thinner materials with close dimensional tolerances are being used, hot wedge welding provides. Which is the Best RF Heat Sealing Service? APPF Incorporated is a domestic product manufacturer in Orange County. We operate out of a 52,000 Sq Ft state-of-the-art facility. Our services are highly customizable, and we work with a vast array of industries, including medical military, and consumer products. Two of our most popular patented designs are our Killer Tomatoes and Inflatable Airbeams. We also make a number of bladders, LAMS, and potable drinking water liners. If you'd like to speak directly with a representative from APPF Incorporated, we would love to hear from you. APPF is a well-known company in Orange County, providing RF heat sealing services for many years. You can trust us.